Wish you could rub a magic lamp so a genie would appear and solve your biggest skin care worries? No need…your wish is my command! These miraculous products will free you from all of your facial “curses”! Your Wish: I want blemish-free skin! 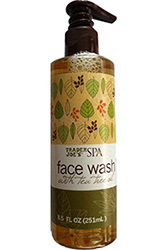 A tea tree based face wash by Traders Joe’s is just what you need. It is packed with key ingredients such as awapuhi, orange peel and lavender, along with the tea tree oil, which is known for its antiseptic properties. This refreshing face wash will leave your skin squeaky clean without stripping it of its natural oils. When you use a face wash that is too harsh and strips your face of too much oil, then your skin will work to produce more oils which could actually make your skin oilier and lead to more breakouts. This face wash is gentle yet very effective. Your Wish: I want my face to be red carpet-ready! Your Wish: I want glowing skin! My once-a-week go-to is Exfolikate by Kate Sommerville. It sloughs off the dead skin cells that are clogging my pores and dulling my complexion. This delicious smelling scrub is packed full of good-for-your-skin ingredients such as pumpkin enzyme, papaya, honey, lactic acid, vitamins A and C and aloe vera…just to name a few! You’ll have smooth, glowing skin in a minute flat! Your Wish: I want to get rid of puffy dark eyes and crow’s feet without breaking the bank! 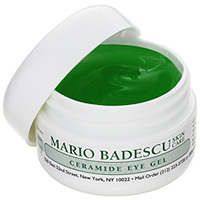 This amazing and unique eye gel by Mario Badescu is only $18 and needs to be part of your morning routine. Keep this gel in the refrigerator and lightly tap it on to your under eye area to help fight all signs of tired eyes. It is also really hydrating without being heavy or greasy. Look bright-eyed and awake and ready to face anything that comes your way!